Beloved and I had dinner at Nanbantei. This Japanese restaurant is located at Bonifacio High Street, a place we rarely go to. According to Beloved, this is not the only branch of this place, and her uncle frequents the same restaurant’s Greenbelt branch, which is another place we rarely go to. This place specializes in yakiniku, or Japanese barbecue. What differs from the norm is that this place isn’t a buffet like YakiMIX or Sambo Kojin, nor is it a barbecue place where you grill stuff on your table. Instead, it’s just your typical sit-down restaurant specializing in yakiniku. 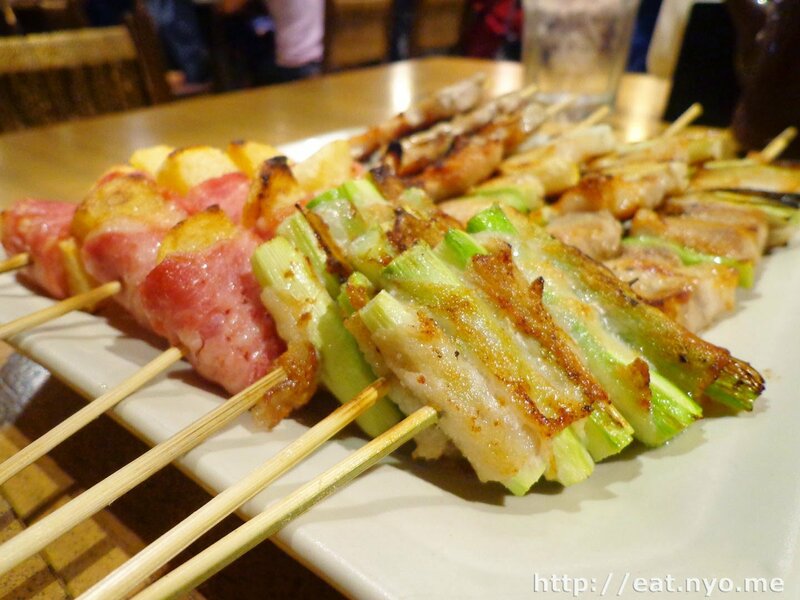 Most of their menu consists of these yakiniku offerings, basically meat or veggies on stick, grilled Japanese-style, each having two pieces per order. However, they also serve platters which are collections of their yakiniku offerings for a cheaper overall cost. We ordered their Best Sellers Platter (985 Php). We also ordered two different kinds of their rice offerings. Beloved got their Yakimeshi or Japanese Fried Rice (110 Php) and I got their Shiitake Rice (100 Php) because it sounded interesting. Because they also had a promo on their cocktails, taking 50% off the price, we got those as our drinks: Japanese Mojito (175 Php normally) for me and Hibiscus Mojito (150 Php normally) for Beloved. Their Best Sellers Platter was served in three separate plates. The first plate contained four different kinds of yakiniku. Counterclockwise from the picture above, starting from the left most, they have their poteto maki, aspara maki, pork garlic yaki, and shiso yaki. I tried the shiso yaki first, which was basically pork wrapped in shiso leaf. It had a peculiar smoky taste to it and a texture that crumbled in my mouth. I honestly don’t know what shiso leaf tastes like, but I guess it had a mild nuttiness to it. Next one I had was their pork garlic yaki. This was a simple one that used pork belly. The garlic flavor wasn’t overpowering, but was present. The real star was the juicy slices of pork. Next, I opted for their aspara maki, which was basically asparagus wrapped in a single piece of bacon. I first thought the amount of meat here was pathetic, and the bacon has almost combined with the asparagus. To my surprise, it turned out amazing! The asparagus was crisp and nicely cooked, and, as I mentioned, the bacon combined with the asparagus and gave it a nice juicy touch. Finally, the poteto maki was potato wrapped in bacon. The potato was cooked through, and turned out to be quite soft. The pork juices were caught in the potatoes, making it a nice, flavorful experience. 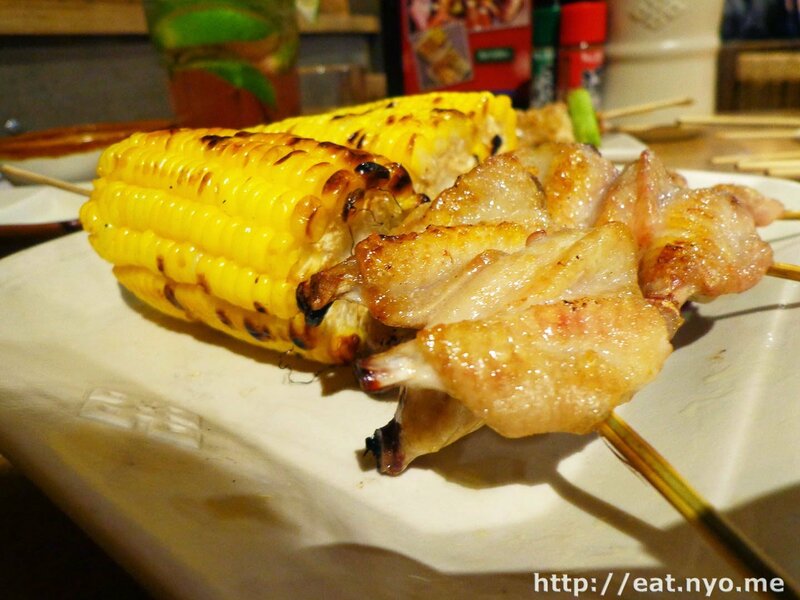 They served their corn and tebasaki, or chicken wings, on a separate plate. The corn was a bit plain, and I think they used sesame oil here instead of butter, which I thought was surprisingly clever. The tebasaki was very good. The skin was quite crisp and the meat fell easily off the bone. Finally, on yet another separate plate, they served their negima. This dish also surprised me. Even though I’m not really that keen on chicken, this one had a very delicious chicken-slash-sesame flavor to it. 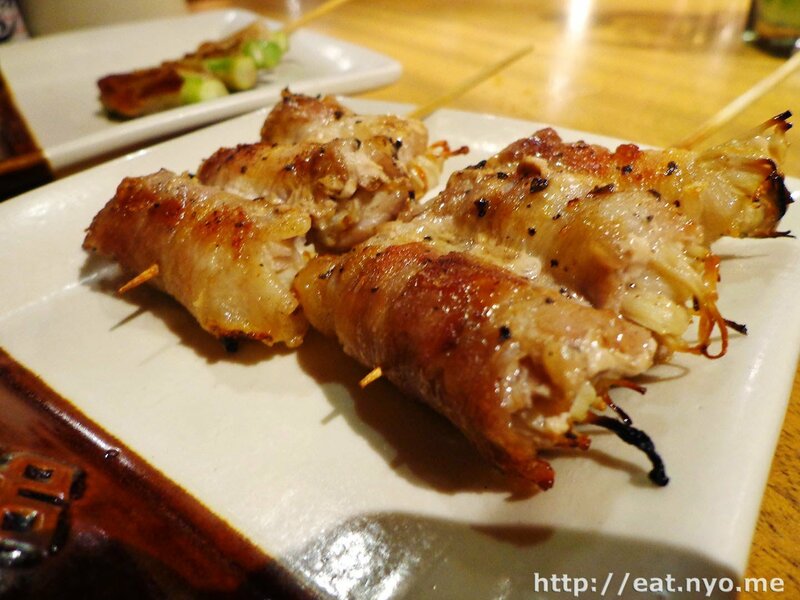 The soft chicken meat complemented very well with the crisp negi or spring onions at the end of the stick. This is probably our top two stick, next to the asparagus, if we were to rank them. Because we thought the Aspara Maki was amazing, we ordered another plate ala-carte (110 Php). We also ordered their Enoki Maki (150 Php). Unlike their platters, their ala-carte orders only had two sticks instead of three. The Enoki Maki, which was enoki mushrooms wrapped in bacon, was probably the juiciest and chewiest order of the night. I like such textures, and because I like the savory flavors of mushroom and bacon, I really liked this dish too. Still doesn’t beat that extra order of Aspara Maki, though, and I was tempted to get another one. Sadly, that’s all for the delicious yakiniku. We ate all these amazing sticks with our rice orders. 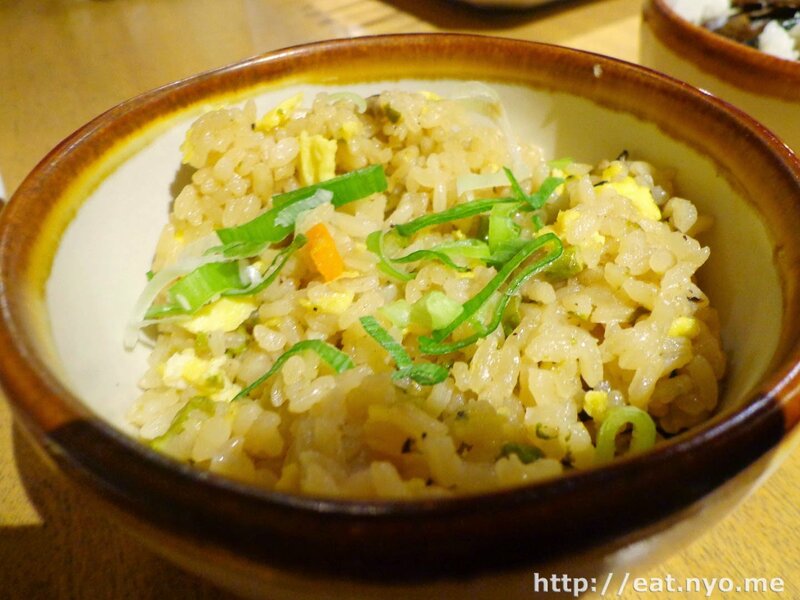 Beloved’s Yakimeshi or Japanese fried rice was served in a humble bowl, but had a lot of toppings to it, including shrimps, eggs, onions, and carrots. It was surprisingly meaty and had a very delicious flavor, making it a nice match to the already appetizing yakiniku we were having. My Shiitake Rice was basically that—shiitake mushrooms and rice. The mushrooms was, luckily, also grilled slightly, so it had that hint of smokiness to it, in addition to the savory and juicy flavors it already has. 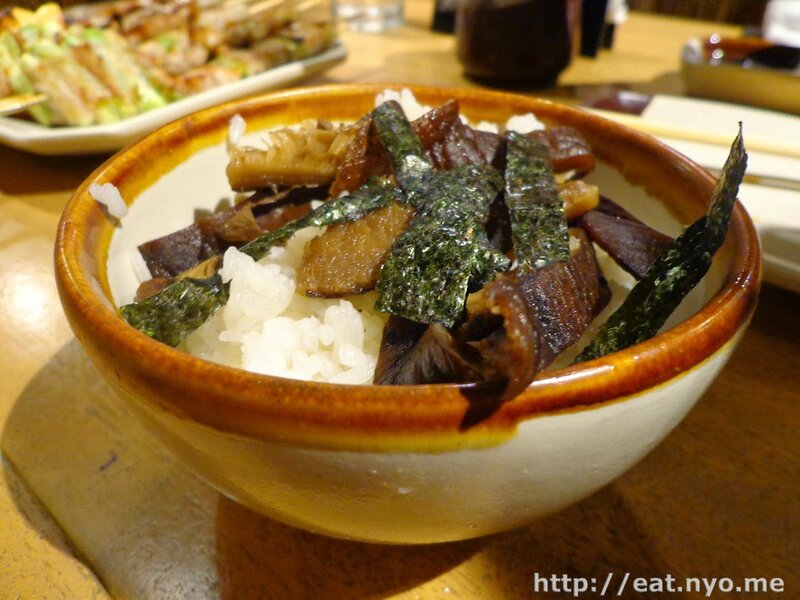 What I found smart was the mushroom juices flowed down to the rice, so the rice; which was purely sticky Japanese rice, I must mention; absorbed some of the nice savoriness. 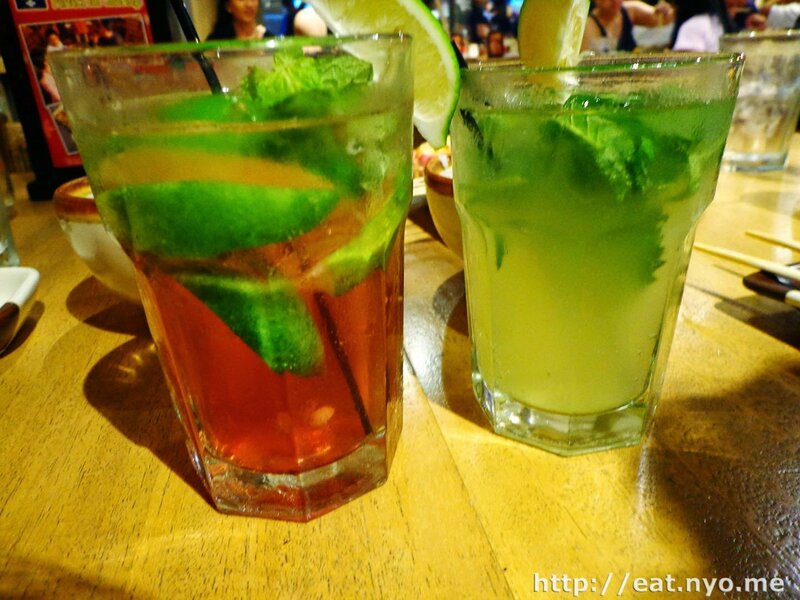 I didn’t really like our minty alcoholic drinks pictured above, Hibiscus Mojito to the left and Japanese Mojito to the right. But that’s just me, I’m just not much of a drinker. Beloved’s Hibiscus Mojito had a strong berry flavor. My Japanese Mojito was sour and minty. They didn’t also succeed in removing our sobriety. But since they were in promo, I guess they were worth it. Overall, it was a surprisingly amazing stay. Even though for the amount we paid, we could’ve had an unlimited version plus other Japanese dishes including sashimi, the quality of the yakiniku here really stood out. Although they were cooked similarly, everything was cooked very nicely. I also think the aspara maki is worth a visit on its own, especially if you like asparagus, bacon, and even more especially if you like both. In fact, as I’m writing this, I’m craving to come back just for another couple of sticks of aspara maki. I have nothing to complain here, except maybe the price tag. But considering the area, their prices are actually competitive. Also, another downside is there are only two branches so far and both are a bit out of reach for northerners like Beloved and myself. However, if a Nanbantei branch opens up in one of the northern or central Manila malls, it’s probably a place we will find ourselves frequent. 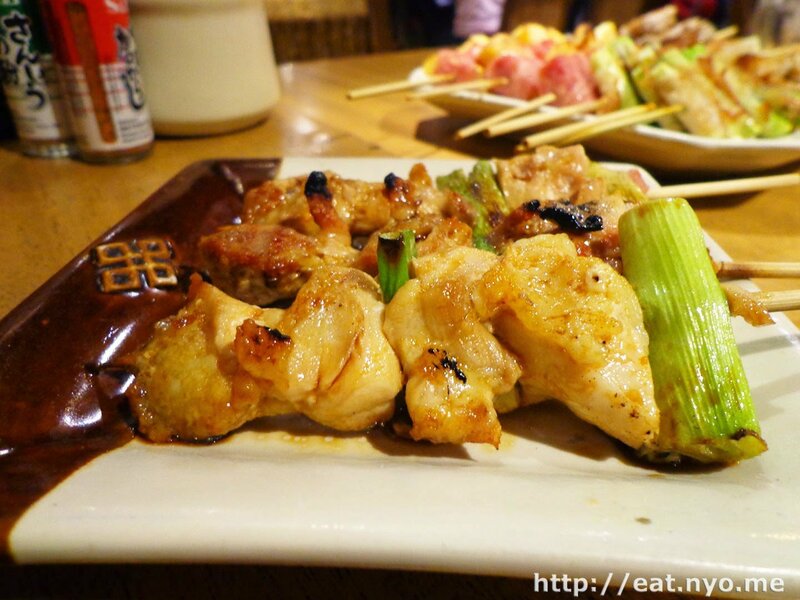 Recommended for: Yakiniku/barbecue lovers with a bit to spend. Not recommended for: Vegetarians, frugal people. Smart nomnomnom tip: Order the platters.